A timecard is a record of hours that a person worked. 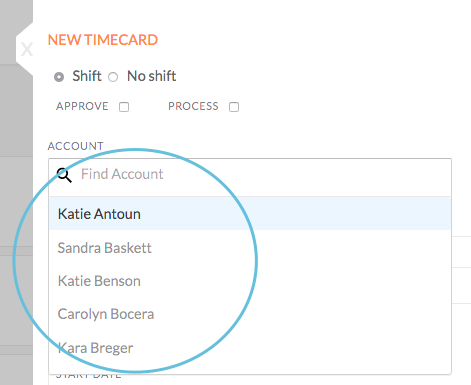 If the timeclock feature is enabled, timecards are automatically created based on clocked in/out times for shifts. If the timeclock functionality is not used then, a timecard can be added. Approve: Approving a timecard locks the timecard from further editing, and removes it from the default timecard list. Note: Be sure to verify that all timecard details are correct before approving it. Process: Processing a timecard removes the timecard from the default timecard list. Note: To view processed timecards, use the filter (see below). 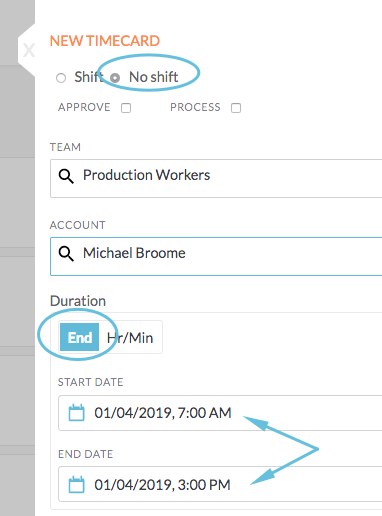 Team: Shows the workgroup (team) associated with this timecard. Account: Shows the person’s name who is associated with this timecard. Duration: There are two methods to enter the duration, either the start and end date and times worked, or the start date and number of hours and minutes worked. Notes: This is a field for notes related to the timecard. Admin / Office: This is a field for notes to the administrative staff. 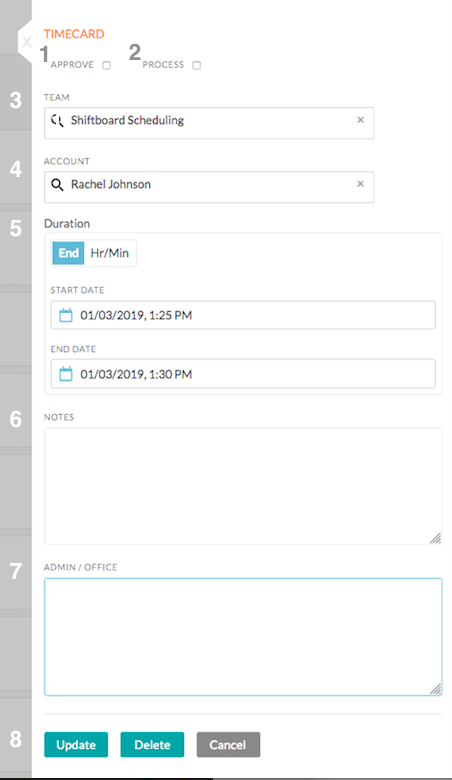 Update: Saves any changes you made to the timecard, including approving or processing it. Delete: Deletes the timecard. Once deleted, it may not be retrieved. Cancel: Cancels any changes you made to the timecard and returns you to the list of timecards. 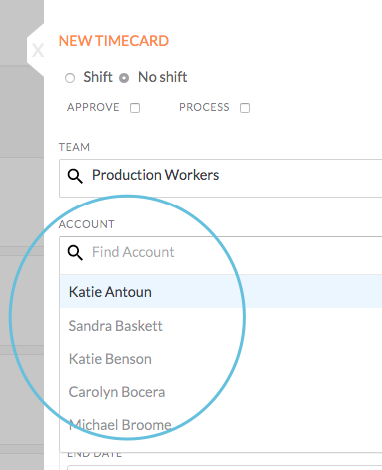 Team: Select a specific workgroup from the the Team drop-down list. You can type the first few letters to shorten the drop-down list.Note: if your workgroup name is not Team, you will see your workgroup name. Account: Select a specific person from the the Account drop-down list. You can type the first few letters to shorten the drop-down list. 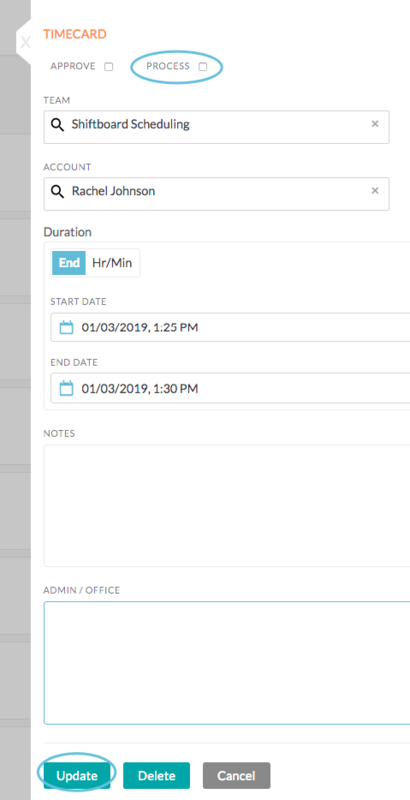 Date Range: Enter start and end dates to see timecards for a specific date range.Note: The date range must be set at all times, and it defaults to the past 30-31 days. Approved: Displays a list of timecards that are already approved. Processed: Displays a list of timecards that are already processed.Note: Checking both boxes will display only those timecards that have been BOTH approved and processed. 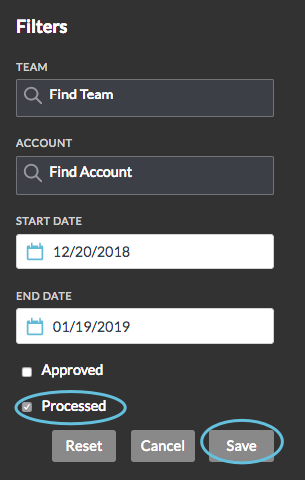 Reset: Clears all filters and returns you to the original list of timecards that have not yet been approved or processed. Cancel: Cancels changes you made to the filter selections, and reverts to the previous filter settings. 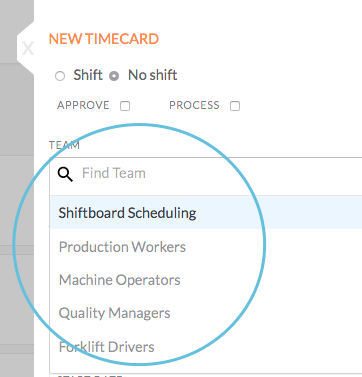 Save: Saves your filter settings, and then displays timecards that match your selections. 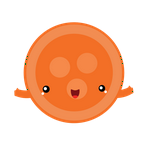 Timecards remain in the default timecards list until they are processed or approved. Make any necessary changes, or add notes. Click the Process checkbox at the top of the page. 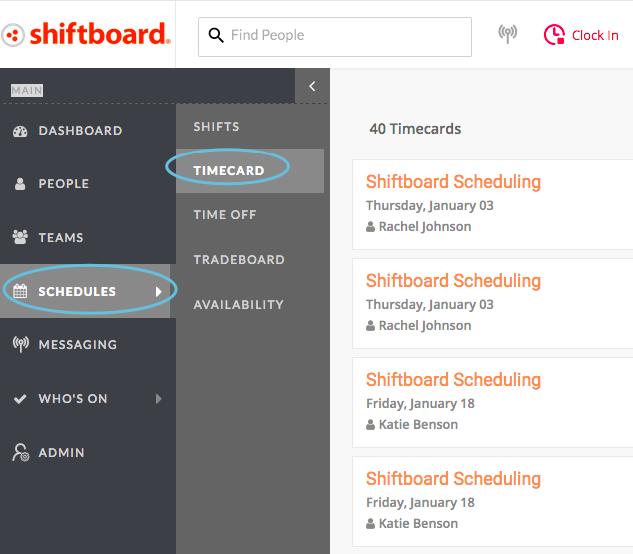 After clicking Update, you will be returned to the default timecard page. 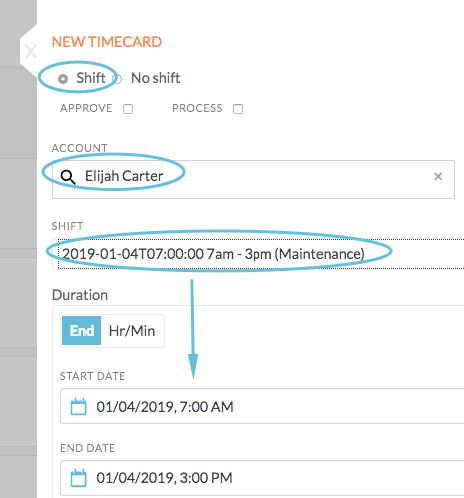 The timecard will no longer be shown in the default timecards list, and a message “Timecard updated” will appear briefly at the top of the screen. Note: To un-process a timecard, open the timecard, uncheck the Process checkbox, and click Update. 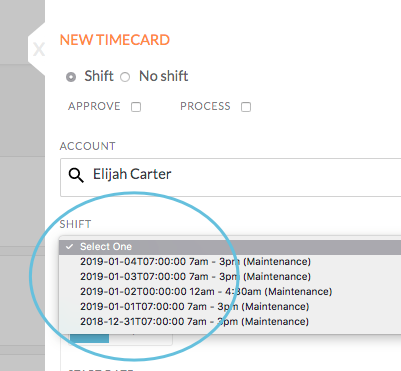 The timecard will once again show up in the default timecards list. Click the Approve checkbox at the top of the page.Note: Once the timecard is approved, it is locked from further editing, so be sure to verify that all timecard details are correct before approving it. Once a timecard is created, it can be edited or deleted. Any changes made by a worker will require manager approval. All timecard updates must be completed before approving or processing a timecard. 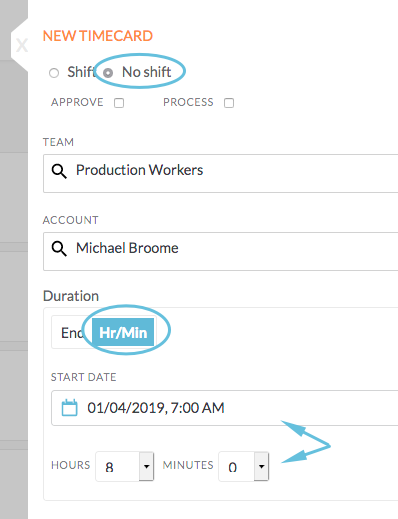 If the timeclock functionality is disabled or someone forgets to clock-in or -out for a shift, timecards can be added manually. a. Team: Choose a workgroup (team) from the drop-down list. You can start typing the name to shorten the drop-down list. b. Account: Choose a person from the drop-down list. You can start typing the name to shorten the drop-down list.